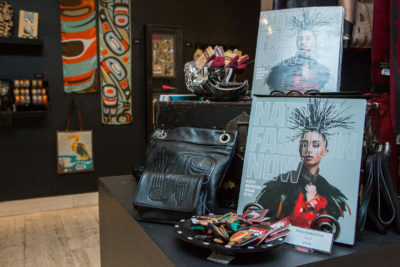 From skateboard decks to pendants and scarves, Native Fashion Now accessories, gifts, and home goods from the designers featured in the exhibition are available for purchase at the Museum Store. 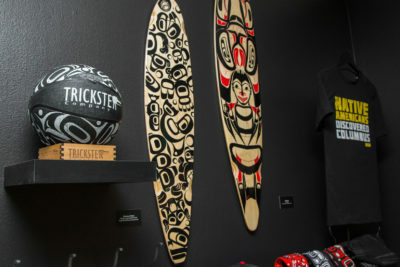 Celebrate street style with Jared Yazzie’s outspoken Native Americans Discovered Columbus t-shirt, Alona Edzerza’s bold hoodies, and Crystal Worl’s breathtaking skateboard decks. Straight out of the exhibition, bring these unique street fashions home with you. Also on offer are one-of-a-kind, exquisite pieces that are works of art themselves. 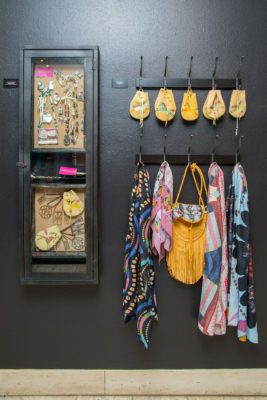 Designer Patricia Michaels, who was also featured on the show Project Runway, used her couture roots to create hand-painted silk scarfs as a way for everyone to be able to take her unique and personal art home with them. 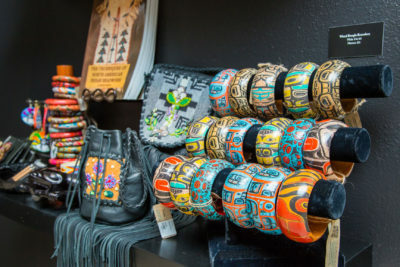 Jewelry designers Wendy Ponca and Jamie Okuma use native materials, designs, and methods like intricate beading, raw leather, and abalone to create breathtaking accessories. Shop these, plus many more extraordinary designs from Native Fashion Now artists. Plus, don’t forget, Museum members receive a 10% discount.